Moe, Larry, and Curly are inept paperhangers who, running away from a dissatisfied customer, run into the arms of Professor Panzer, a mad scientist played by Three Stooges regular Vernon Dent. The mad scientist wants to transplant a human brain into his gorilla, Igor. And Curly’s tiny brain is just right! However, the Stooges (and Igor) have other ideas! A Bird in the Head begins with Three Stooges (Moe, Larry, and Curly) working as inept paper hangers, wallpapering an apartment. This gives a lot of room for physical slapstick comedy, such as Curly stirring the wallpaper paste, tasting it, and adding salt and pepper to the mixture. Larry has a funny bit assaulting Moe with a ladder, and then a classic bit of clown comedy Moe orders Larry to “put that plank up out of the way,” which Larry proceeds to do and step away, only to have the plank fall back down and miss him by inches. This is repeated twice, and then Moe decides that the only way to get something done is to do it himself, and puts the plank against the wall. Only to be hit by the plank! Eventually, the Three Stooges are done wallpapering the room – papering over the door, window, bookshelf, etc. Their employer sees the ‘expert’ job they did and threatens them, causing them to run out of the room and across the hall, where the body of the short film happens. They’ve run into the room of Professor Panzer, played with zest by Three Stooges regular Vernon Dent. The mad scientist aims to make medical history by transplanting a human brain into the body of Igor, his gorilla if only he can find one small enough. And then he meets Curly! It was an awful tough deal for a novice rookie director to have a Curly who wasn’t himself. I had seen Curly at his greatest and his work in this film was far from great. The wallpaper scene was agony to direct because of the physical movements required to roll up the wallpaper and to react when it curled up in him. It just didn’t work. As a fledgling director, my plans were based on doing everything in one nice neat shot. But when I saw the scenes were not playing, I had to improvise and use other angles to make it play. It was the wallpaper scene that we shot first, and during the first two hours of filming, I became aware that we had a problem with Curly. Moe (Moe Howard): Somebody’s nuts around here. Larry (Larry Fine): It ain’t us. Moe (Moe Howard): Maybe he’s a head hunter. Larry (Larry Fine): If he’s a headhunter, he’s huntin’ small game. Professor Panzer (Vernon Dent): Gentlemen, you will live in luxury as long as you live! Curly (Curly Howard): What if we don’t live too long? Professor Panzer (Vernon Dent): Well, gentlemen, here are your quarters! Curly (Curly Howard): Two bits a piece! Larry (Larry Fine): The doors are locked, the windows are barred, and I don’t like it if you ask me! Moe (Moe Howard): Nobody asked you! Moe (Moe Howard): Say, are you scared? Curly (Curly Howard): No. It’s silly to be scared. Larry (Larry Fine): It sure is! Professor Panzer (Vernon Dent): Come here, please, stand behind this screen. Larry (Larry Fine): Lucky guy gets a screen test. Larry (Larry Fine): It’s a bird! Moe (Moe Howard): A bird in the head is worth two in a bush. Moe (Moe Howard): Ya monkey, what’d ya bring that ape in here for? Curly (Curly Howard): [to Igor, drinking grain alcohol] No ya don’t! That stuff’s bad for ya! It’ll make a monkey out of you every time! The animation of the cuckoo clock inside Curly Howard’s head was done by Tex Avery. Longtime Stooge sound man Edward Bernds makes his debut as a director. He made this film before directing Micro-Phonies (1945), which was released earlier. 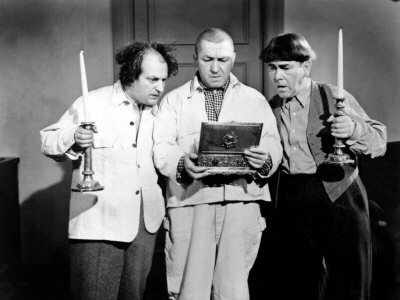 Bernds would go on to direct the Three Stooges for the next seven years.